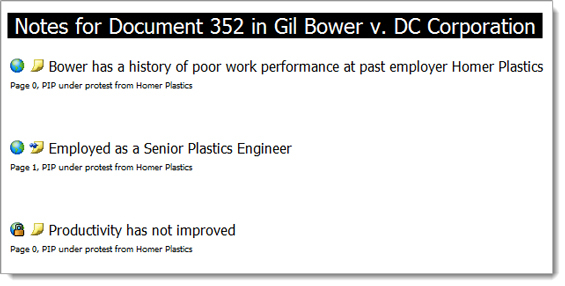 Case Logistix® allows you to view and print a list of notes for a document when you create a Notes Report. You can also include notes when you print a document. 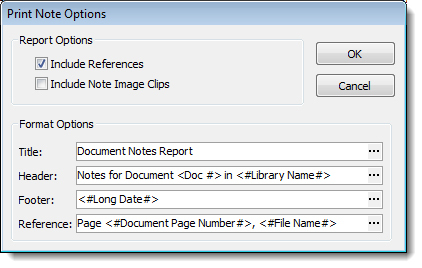 The Notes Report compiles a list of all notes for a document. When you create a Notes Report, you can accept the default information for the report title, headers and footers, and reference information, or you can customize the report using the Format Expression Builder. For further information on the Format Expression Builder, see Case Logistix online Help. By default, the format options are entered for you. Type different options, if desired. On the File menu in Case Logistix, point to Print, then click Print on the menu. 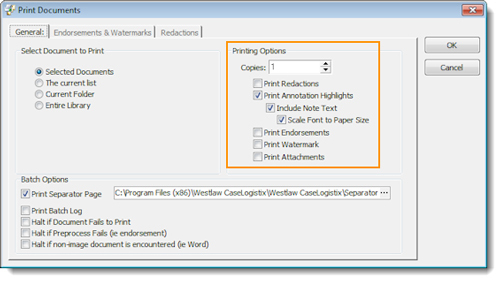 The Print Documents dialog box is displayed. Note When you print a document with its notes, the document image is scaled to 90% of its original size to accommodate the notes and a black border is printed in the left margin and footer.